Just think about how often you use your elbows in day to day life—they're necessary for everything from dressing to driving to eating and drinking. At Balanced Health Medical, we can connect you with a Midtown chiropractor who can help you find relief from "funny bone" pain—which is anything but funny! People of any age can strain or sprain their elbow, and it's common among people who are active. Two of the most well-known types of elbow strains are known as golfer's elbow and tennis elbow (medial epicondylitis and lateral epicondylitis, respectively). These injuries occur when the connective tissue and tendons on the inside or outside of the elbow become inflamed, generally due to overuse. Elbow bursitis (inflammation of a small fluid filled sac near the elbow that normally reduces friction between tendons and bones) is often related to muscle sprains and overuse syndromes. Another common cause of an elbow sprain or even elbow fracture is a fall on an outstretched hand (a so-called FOOSH), such as what might happen when you go to break a slip and fall. Of course, falling directly on the elbow can also lead to damage to the ligaments and other tissues around the elbow and can severely limit function at this simple hinge joint. 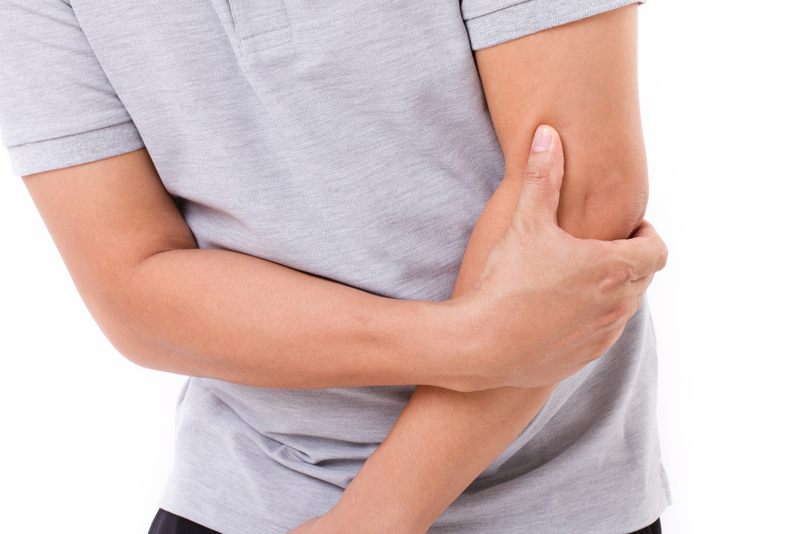 Elbow pain can be frustrating and debilitating. To find relief that doesn't involve drugs or invasive procedures, connect with a Hell's Kitchen chiropractor today by contacting Balanced Health Medical at (212)-755-1717; located at 133 E 58th St #1101 in New York, NY. We proudly serve the 10022 communities of Midtown East, Midtown West, Rockefeller Center, and greater Manhattan.